Digital Marketing is an emerging field where knowledge of the current trends is a must. It has become essential for several businesses as well as individuals and despite of promises made by many for helping you to master it, there are only a few who are really useful and practical. The problem with this field is that it constantly changes by each passing day. Thankfully, there are some renown marketers who are kind enough to share their knowledge through social media or blogs without any demands. Here, I have listed some of the great digital marketing blogs which not only helped me but numerous other individuals worldwide. 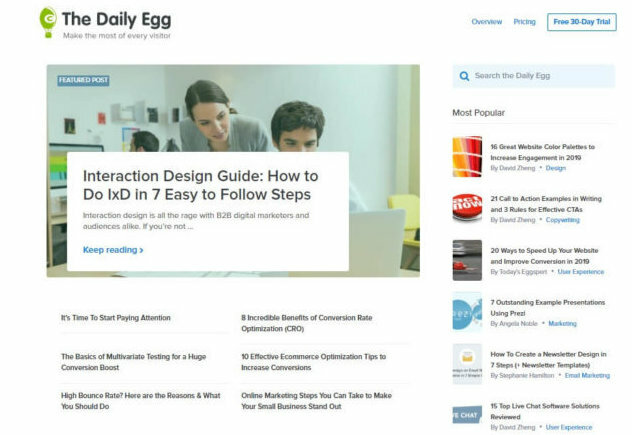 So, let’s take a look at the most famous and popular marketing Blogs. You can simply refer to Neil as one of the legends of current traffic generation industry. He is God to some and mentor for many digital marketers. Neil is one of the most reliable man and when it comes to online marketing; he knows almost everything. Neil is also the co-founder of KISSmetrics, Crazy Egg, Hello Bar and Stride. With the titles like ‘the top influencer on the web’, ‘one of the top 10 online marketers’ and others backing him, he is also a regular blogger. He writes with the aim of helping companies and individuals to generate more traffic. Unlike many others in the industry, he shares everything which he knows. His articles are usually extra large, extensive and unique which helps almost everyone. If you are a beginner in the marketing industry, then Neil Patel’s article must be your first stop for getting started. It was initiated by Darren Rowse who is residing in Melbourne. He is a blogger, consultant, speaker and the founders of several blogs. Initially, Darren started his blog journey by writing on Pop Culture and Spirituality then soon, he started several other blogs. He admits that the grown popularity of his blogs transformed his hobby first into a part-time job, and then to a fully fledged business. ProBlogger has become one of the most popular blogs in the marketing niche which helps bloggers to earn money through their blogs. ProBlogger cover topics such as content writing, SMO, SEO and others. If you are a newbie in the blogging industry, then ProBlogger can be the perfect place to gain correct ideas about increasing your traffic, different monetization ways, social media promotions and much more. It is founded by another blogging giant of marketing niche, Brian Clark. He is a serial entrepreneur, a writer and an avid reader. Since its incorporation in 2006, its main goal is to teach people how to write a killer online content. Brian started CopyBlogger as a simple one-man blog which eventually grew into a highly profitable company with 8 figures in annual revenue. 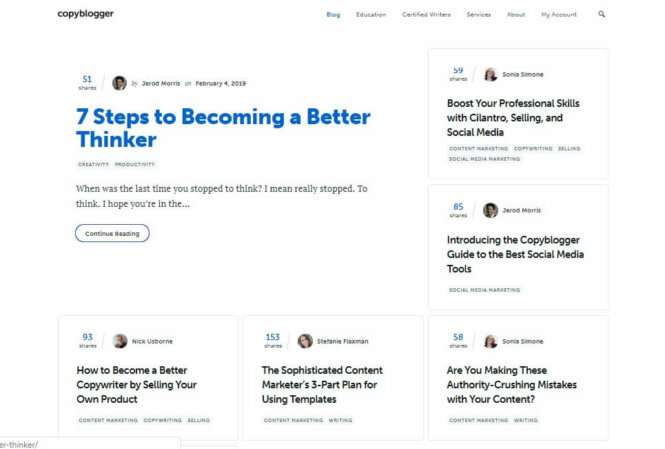 Copyblogger is a perfect website for everyone who wants to improve their writing, increase their website traffic and boost sales. It helps you with creating the right content for a specific audience and even to post it on the correct time. It is a software as a service company based in Philadelphia known for website analytics and marketing tools. 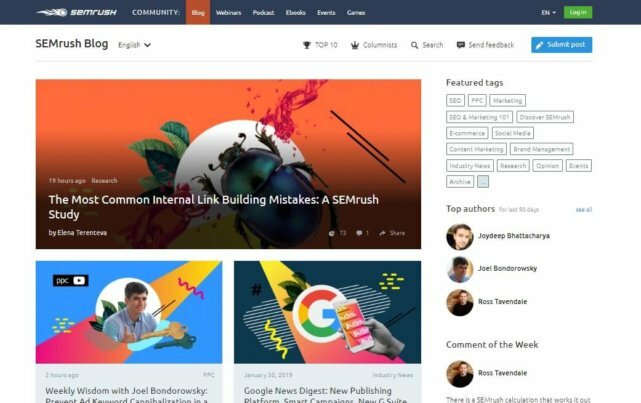 SEMrush was launched in 2008 by O. Shchegolev and D. Melnikov as a SEO tool along with the blog focusing on digital marketing. Their mission of making online competition fair and transparent with equality in the opportunities are enough for the users. Regularly publishing insightful contents on online marketing has helped them to make their mark globally. The articles are mainly related to SEM, SEO, PPC, Content Marketing/Strategy and others. Seths.blog is run and authored by Seth Godin. He doesn’t need any introduction as he is already the author of 18 best-selling books. Seth is “the ultimate entrepreneur for the information age” according to Business Week. Along with his books, he is also known for his blogs which he writes with the aim to create a positive change in the world of entrepreneurship. Seth knows how to convey powerful messages in the least amount of words. Most of his blogs are shorter as compared to others but delivers relevant information helping online marketers. It was founded by R. Fishkin and G. Muessig in 2004 and was initially named as SEOmoz. According to their founders, its name was inspired by different organizations like DMOZ, Mozilla and Chefmoz. Moz is also software as a service company which is based in Seattle and they have their own blog. Today, the demand for SEO and great content are the two most valuable things required by the marketers. Moz’s vision of bringing opaque SEO industry is enough to tell you that it comprises everything revolving around SEO, content marketing, website design, optimization, updates by Google and others. 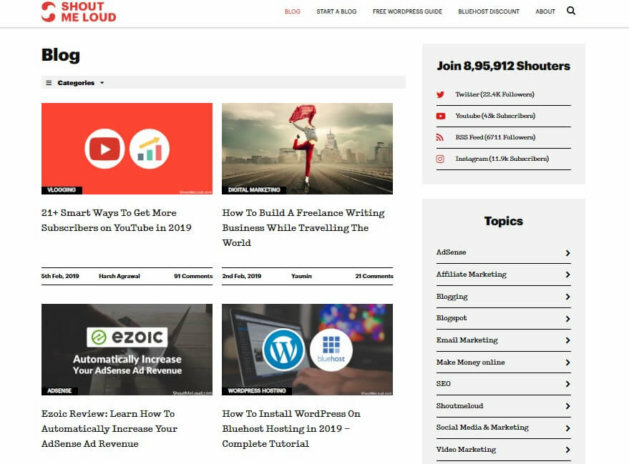 It is another product from Neil Patel’s armory which is known for providing fresh news and ongoing trends in digital marketing. 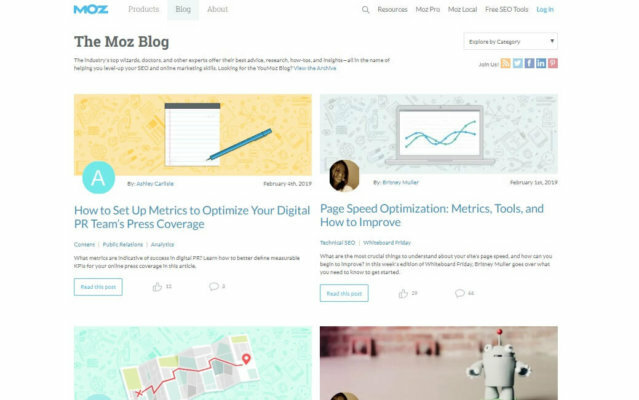 Mainly, CrazyEgg is known for heatmaps and A/B testing which is used by tons of websites. However, they also run a blog whose contents generally revolve around online marketing, website optimization and so on. They are known for publishing quality and relevant content which most of the digital marketers find it useful. It is a blogging platform for one of the largest e-Learning company i.e. Eduonix and is publishing content for over 6 years. Basically, blog.eduonix is known for hundreds of extensive articles focusing on a myriad of subjects. Although, it is not a marketing focused website but the marketing category consists of hundreds of articles. Herein, you’ll find everything from SEO tips to different hacks for growing your business. Additionally, you’ll also get articles from several other categories like AI, programming, gaming, content writing, web development and others. Jeff is an Australian-based blogger known for writing in-depth content on almost everything. Forbes listed him as a “Top 20 Influencer of Chief Marketing Officers”, Apollo Research ranking him as a “Top 20 Influencers of Digital Marketers in the USA” are his few achievements among others. From eye catchy images to awesome headlines, his blogs contains everything. Apart from several known recognition, when it comes to blogging, all the articles revolve around content marketing, social media marketing, e-mail marketing and so on. 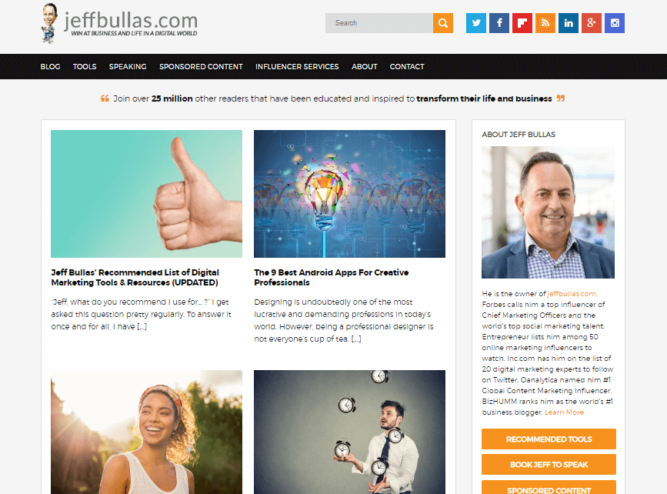 If you are thinking about monetizing your blog, boosting your website traffic and creating engaging content, then Jeff Bullas Blog is for you. Among his numerous contents, some notable ones describe the importance of visually appealing content on digital media. A blog led by Harsh Agrawal who believes in simplifying the complex things. He started ShoutMeLoud by the end of 2008 after borrowing his friend’s credit card. Harsh did not only created a ShoutMeLoud but also build a community of like-minded bloggers known as “Shouters”. Over time, ShoutMeLoud has successfully created its impact on several individuals making them financially independent. ShoutMeLoud focuses on giving practical tips on SEO, WordPress and promotions on social media. It shares the knowledge of making money from your blogs making you independent. ShoutMeLoud is also known for providing great tips for different businesses and numerous entrepreneurs. You will also get to know hundreds of ways by which you can increase the traffic of your website and brand value. So, this was my top 10 lists of trending marketing blogs which helped me to grow over the time. What do you think? Have we missed any then do post it in the comment sections below. During my initial days of learning, Neil’s Blog helped me a lot. He writes every blog in simple language and has amazing content.